Iceland has ice. Glaciers cover 10% of its landscape, including its highest volcanoes. Of its frequent eruptors, only Hekla is (almost) ice free. Katla, Bardarbunga, and Grimsvötn, which together account for the large majority of eruptions, are all hidden underneath ice sheets, which gives problems studying the volcanoes themselves. But a more serious issue is that ice on a volcano can be a dangerous combination. Even minor eruptions can generate catastrophic melt water floods which destroy everything in their path. These are not just flash floods. Think of it as a tsunami coming down the mountain. Several volcanoes in Iceland are frequent offenders. But the infrequent ones may be more dangerous than the usual suspects. Öræfajökull is one of those infrequent erupters. It is Iceland’s tallest volcano, and is the fourth tallest stratovolcano in Europe (after Elbrus, Etna, and Beerenberg). The name gives an indication of its nature: Jökull means glacier. The mountain itself has no single name (the original name was Hnappafel), only its ice cover does. This is a wild land with a glacier that towers over its mountain. After the settlement of Iceland, the fertile plains on the southwest of Öræfajökull were called Litla-Hérað and although isolated, the area was densely populated with twenty or more farms and several churches. (The name ‘Hérað’ was used for a wealthy parish, so Litla-Hérað was a ‘small major parish’.) On the southeast side of Öræfajökull was Breiðamörk, also well-off, where around 900 AD, the settler Þórður Illugi built a farm at Fjall. The farm did well, acquired a church (or the church acquired the farmstead – both happened at times), and a large number of other farmsteads came. At that time the glaciers were much smaller than they are now, and between the glaciers and the coast was a prairie-like landscape with lush grass, copses of trees, and rivers. It must have seemed like heaven. And than the disaster of 1362 struck. Afterwards, the land was left empty for over 40 years. When people returned, they called it ‘Öræfi’, meaning wilderness. The glacier took its name from this. Today, the fluvial sand desert of Skeiðarársandur borders where once the paradise of Litla-Hérað was. The glacier-covered mountain of Öræfajökull dominates the skyline here. Its caldera, 14 km2 in areas, is filled with ice, 550 meter deep. Around the caldera rim are the individual peaks of the volcano: Hvannadalshnúkur , Rótarfjallshnúkur , the twin peaks of Hnappar, Sveinstindur and Sveinsgnípa. Hvannadalshnúkur is the tallest, at 2110 meter, and is the highest mountain in Iceland (albeit by a margin of only ten meter). The mountain is 20 km across at its base near sea level, making it rather steep. A quarter of its base area is covered by the glacier. The volume of the mountain is around 370 km3, which makes it the largest volcano in Iceland by volume as well as height. 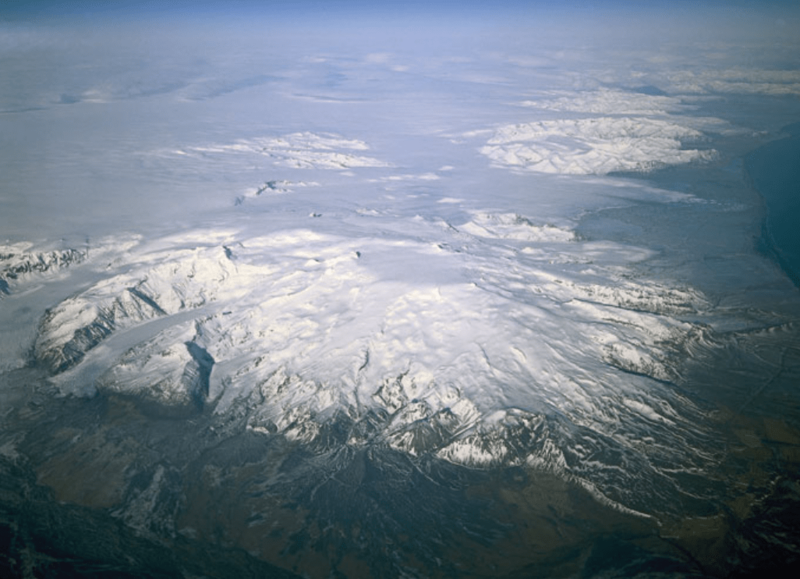 Öræfajökull has another claim to fame: it has Iceland’s highest amount of snowfall. Each year, over 10 meter of snow accumulates at the summit. The glacier did not get there by accident! The rain in Iceland comes mainly from the south (the north is drier), and Öræfajökull is close to the sea – it captures quite a lot of it. At sea level the weather is not quite as wet, and there the climate is mild – for Iceland! The current mountain formed when two older, adjacent volcanoes merged. This was during the ice ages, when the glaciers hemmed in the eruptions. They kept the lava close to the eruption sites, and forced the mountain to build upward rather than outward. This is why the mountain is both tall and steep: it was made that way by the containing ice. The largest explosive eruption in Iceland since the settlement occurred with little warning. Whether the mountain was known to be volcanic is not known, but it had been quiet ever since the settlement. The explosion in 1362 blew out 2.5 km3 of rock, or 10 km3 of tephra. Of this, 2km3 fell on land, mainly on the southeast of the country. The western parts of Iceland were protected by the westerly wind of the day of the eruption. The debris caused damage 70 km away, but the wind blew a lot of the tephra out over the ocean. Six jökulhlaups came out from the various glacial outlets, mostly to the southwest. The Litla-Hérað region never fully recovered its vegetation: the debris from the eruption is still evident in many places. It is among the least recognized volcanic disasters of the last millennium. The report of ash in the north refers to the fact that this document was written in the north of Iceland. Thus, it describes a local impact and does not imply that ash did not fall elsewhere. At the time of writing of this annals, the area of Litla Hérað had not yet been resettled. People began to move back in shortly after, but this was 40 years after the event. After the eruption, the area was left not just depopulated, but also uninhabitable. The ‘roads’ of course refers to a poorly visible path or track, not an A-road! It was so dark that the track could not be picked up – not complete darkness, perhaps, but darker than twilight. ‘Anno 1366: Fires arose in Litla Hjerad and destroyed the whole region: there once had been 70 farmsteads: no single living being left except one olde woman: and mare’ The year that is stated is not exactly correct, but it must refer to the 1362 event. The later stories about the death toll of the 1362 eruptions and about the two survivors come from this, but this detail is not backed up by the earlier report. The total population of the area has been estimated at a few hundred people, based on the number of farms, so this would imply a survival rate of less than 1%. These stories give rather little to go on. Their emphasis is on the effect of the floods (the jökulhaups), and the surging glaciers. Ash is only mentioned as falling towards the north. However, this description must be incomplete. The floods were enormous and devastating, but the damage was from more than just water. I will come back to this later. The lack of survivors has meant part of the real story was lost, and the reports could have been based on later exploration of the damage, rather than reports from eye witnesses. The layering of the tephra deposits found by geologists have suggested that the explosive event was brief, a day or less; the reports that the eruption lasted until the autumn may refer to minor later eruptions, or just refer to ice or permafrost geysering from the heat. This was a much smaller eruption, which produced about 0.2km3 of ash. It came after 450 years of quiet. The first sign of trouble was a series of felt earthquakes, on Sunday 7 August 1727, beginning during the church service. For a while things calmed down, but early on Monday the shaking became severe enough to do damage inside the farmsteads. At 9 o’clock a huge crack in the mountain side appeared and jökulhlaups burst out from beneath several of the glacier outlets. They destroyed the fields, but only three people were reported killed. The flood waters bore boulders, pumice stones, ash and icebergs. The ash fall made everything dark for three days, but it cleared up on the fourth day, after which there was little further ash fall. Volcanic ash covered the farmlands of Svínafell and Skaftafell, and there was no hay that summer in the districts nearest the eruption site. Sandfell, the main settlement, was missed by two landslides, coming down on either side! In another version, rather than the cattle it was one of the missing people that ended up boiled. Jón Þorláksson later commented that the floodwaters had been so hot that the horses shied from them. It appears that the eruption itself took place within the caldera (as it did in 1362). The jökulhlaups came before the main explosions. The melt water came from a fissure, on the western side, about 1100 meter above sea level. Six or seven columns of flame were seen within the fissure, and smoke was visible until the following spring, but no evidence of any flow of lava. In fact, Dave McGarvie (https://ounews.co/science-mct/science-environment/icelands-tallest-volcano-awakening/) mentions that there are massive ash and pyroclastic deposits visible in the landscape. This explains why the land was left empty for so long, and why it became a waste land. The ash and tephra had covered the land and killed all vegetation. The farms were wealthy before, but after resettlement, the farming was poor, and the land had lost its fertility. In 1362, there appears to have been a sequence with, in order, tephra and ash, followed by pyroclastic flows, followed by pumice. Jökulhlaups were the afterthought. In 1727 the jökulhlaups came first and did almost all of the damage, but the subsequent ash was still significant, in spite of the eruption being puny compared to 1362. Interestingly, archeology of the farmsteads of 1362 suggest that they had been abandoned, together with their valuable content, before the ash and pumice from the main eruption destroyed them in 1362. When the buildings collapsed under the weight of ash, they were already empty. People had time to flee. Did they make it to safety? That we don’t know. They may well have been killed by the rain of hot pumice. Another point to make is the effect of the ice. At the time of the 1362 eruption, glaciers had begun to grow but probably were still small compared to later. In 1727, the glaciers were much larger, and were still growing as the Little Ice Age moved towards its peak. Farmsteads were being destroyed by the advancing ice. The two eruptions occurred with very different sizes of the glaciers and this may have affected the flow direction and severity of the jökulhlaups. Nowadays, glaciers are rapidly diminishing but are still large. It may not be easy to predict how the floods would flow under current ice conditions and we should be careful with extrapolating from the two known eruptions. The past is not always a good indication of the future. An interesting question is where the 10km3 of tephra in 1362 came from. The caldera where the explosion occurred is 14km2 in size and up to 500 meters deep, giving a maximum volume of 7km3. The volume will be a bit less if the caldera is bowl-shaped. Now the tephra is considerably expanded compared to the rock that was blown up. The dense rock equivalent (DRE) is 2.5km3. This means that the caldera is larger than the eruption volume, or at worst similar in size. Part of the caldera may in fact come from the 1362 eruption. However, the numbers leave no room for any mountain peak on top of the caldera. It appears likely that there was already a depression, but that it was enlarged by the explosion. The rim of the caldera was probably already there at the time, but perhaps not fully in its current form. Of course, an excavated hole may have been filled in by lava after the eruptions: how can we tell, beneath half a kilometer of ice? But Iceland’s volcanoes are a changeable lot. Big eruptions can re-design their shapes. The main source used for this post is Helgi Björnsson, The Glaciers of Iceland, published in 2017. I do hope so, will give them time to evacuate the area. Hopefully like 63 in that it was effusive for a couple of weeks before turning violent. Also the heat signature has faded. Thick wet clouds or a pause? Why is there a difference in the three plume colours the two one in the middle and one on the left look like Ash plumes but what is the brighter plume third on the right. People are trying to leave as thick ash is falling. I knew they were staying too long! Let us hope they make it away..
Looks like lava running down the slope now . Can you send over a live stream link please? A volcano on the Indonesian island of Bali has erupted for a second time in less than a week, spewing ash into the air and prompting nearby villages to evacuate, officials say. Some flights to and from Bali have been canceled. Since 23.15 there is a little ticker line. Not such intensive as a continuous tremor after first phreatic eruption. 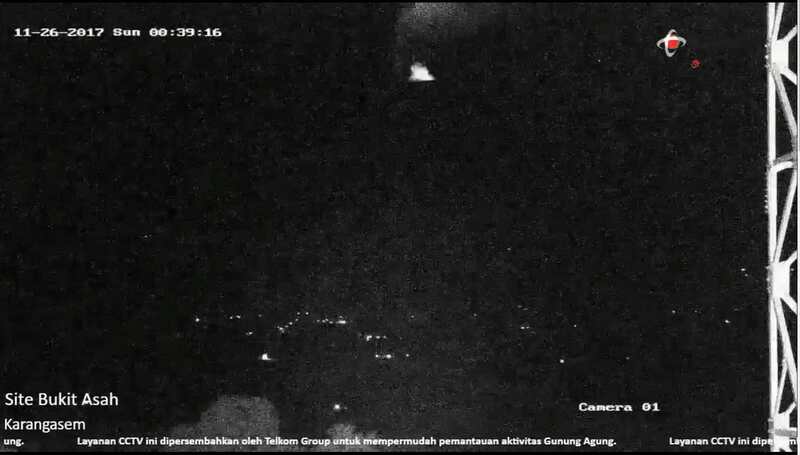 Seems like ash falling in Karangasem webcam. Camera was jerking around about 20 mins ago as well. It looked a little mechanical…don’t know what that was about, and several diffuse flashes over the last hour or so. I don’t know what sunrise will reveal…. Is that a huge black cloud we can see coming out of the crater ? Having a chuckle to myself now as to what question I asked the answer is blatantly obvious. Could this though contain poisonous gas people are stood watching this should they be so close ? #Agung VONA Summary: Eruption with volcanic ash cloud at 2105 UTC (0505 LT). Eruption and ash emission is continuing. Best estimate of ash-cloud top is around 16454 FT (5142 M) above sea level, may be higher than what can be observed clearly. (11)	Volcanic Activity Summary	:	Eruption with volcanic ash cloud at 2145 UTC (0545 LT). Eruption and ash emission is continuing. (12)	Volcanic Cloud Height	:	Best estimate of ash-cloud top is around 19654 FT (6142 M) above sea level, may be higher than what can be observed clearly. Source of height data: ground observer. (14)	Remarks	:	Seismic activity is characterized by low frequency earthquakes. 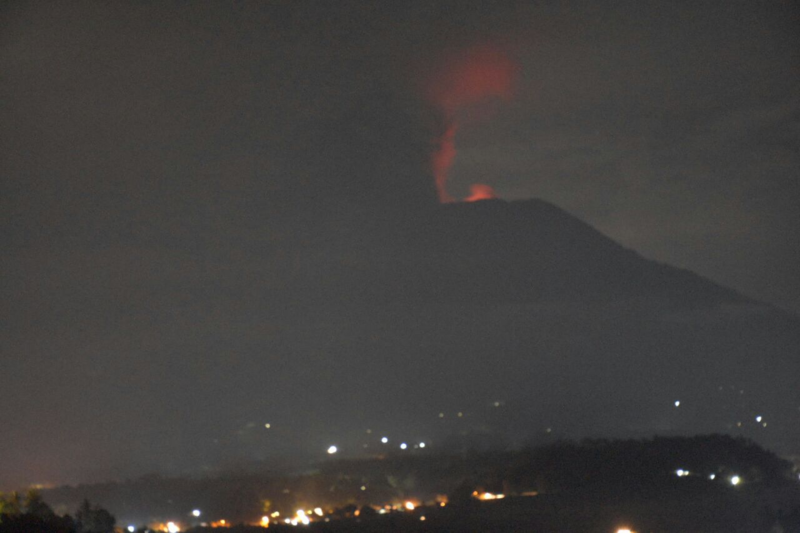 The eruption of Gunung Agung is currently ramping up with ash at 7km and condition RED for the volcano. So far the preparations of Badan Geologi and PVBMG seems to be holding and no casualties are reported as of now. This eruption also caused the creation of the shortest bulletin note in volcanological history: “Gunung Agung erupsi tephrik”. Even the Icelanders can’t cram that much info into 4 words. It is my sincerest wish that this eruption does not escalate further. But, the eruption is covered by some of the finest volcanologists on the planet, and they are well prepaired for this. Among them is our esteemed friend Igan S. Sutawiyaja (whom we hope to hear back from soon). @id_magma: Urge communities and people around #Agung #volcano not to go within a radius of 6 km from the volcano and 7.5 km on the North-Northeast and Southeast-South-Southwest. Estimated danger zones are dynamic and continuously evaluated and can change at any time. I do hope agung does settle down. This does not look good. I do have a question for the readers. Is there any relationship between askja and herdubreid ? With deep quakes around askja and the growing activity around herdubreid again . And the whole rifting episode of which i remember the dyke was heading towards askja but stopped. IMO i understand that this event has not been witnessed before but the whole scenario does seem rather complicating and puzzling . and then it seems to have frozen..
1362 was the year of The Great Drowning, affecting Scandinavia, the Netherlands and UK – January 1362	” St. Mary’s Wind “: A severe gale / storm (at least as powerful as that of October 1987) from between south and west commenced on the 15th (23rd new-style) January 1362 and lasted for about a week – affecting large areas of southern Britain. A large number of buildings were blown down or damaged, including St. Pancras Church, the church of Austin Friars in London, Norwich cathedral and the (original) Abbey Gateway in St. Albans. Damage also to shipping. The “exceptionally ‘severe gale’ caused great destruction – buildings, towers, trees, wind-mills etc., all ‘thrown down’ according to contemporary chronicles. Noted by English, Scottish & Irish sources. The “Great Drowning” (‘Grote Mandrenke’) causing widespread / severe damage across SE Britain – also along the East Coast, and as 60 Danish ‘parishes’ are noted as having been ‘swallowed up’ by the sea, with several thousands dead there, it suggests a rapidly-deepening low moving swiftly across southern Britain and the southern North Sea with a high storm-surge event. Thanks Alyson. The storms cannot be due to the eruption, as they happened well before. There could be a relation between the next winter and the eruption. Certainly the eruption was large enough for local impact, and as it happened in summer it could have caused the seas in the north Atlantic to remain cold. There are no reports of dry hazes so you are looking for local effects. One option is that the ash caused enhanced ice melt (black is not a good colour for snow and ice), and melt water can also cool the sea. New post is up, Agung in 1963. In the imaginatively named hamlet of Hoff, they don’t seem in a rush to replace their rusty roof iron :).